The Blue Train is unique. It is not merely a train but combines the luxury of the world's leading hotels with the charm of train travel. Think of it as an all inclusive luxury rail cruise with an opportunity to view South Africa's spectacular landscapes and visit interesting tourist attractions along the way. Take a journey into a timeless world of grace, elegance and romance, where spectacular scenery stirs your imagination and luxurious comfort soothes your body and soul. It's a journey of a lifetime for those who appreciate finer things in life. Lounges Each Blue Train has two lounges: the main lounge and the Club lounge. The Club lounge, has a more masculine ambiance and is expected to find favour with those seeking a peaceful place for after-dinner cognacs, coffees or cigars. This area is the only section of the train designated for smokers. High tea is served each afternoon in the main lounge. Another attraction of the opulent main lounge is the giant-size TV monitor revealing the unfolding scenery of the track ahead, courtesy of a camera mounted onto the front of the locomotive. The ambiance of the lounges is one of warm elegance. Large windows allow for panoramic views of the passing countryside. All lounges are fitted with gas filled air-conditioning systems. The temperature is centrally adjusted to a desired coolant temperature. During cooler periods, the under-floor heating provides guests with desired warmth to ensure their comfort at all times. 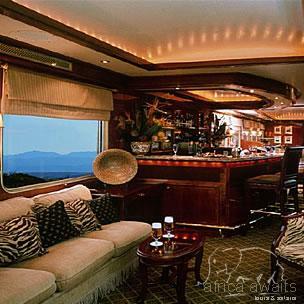 Suites With interiors created by a leading interior architectural design company, The Blue Train will rival many a five-star hotel in terms of elegance, grace, comfort and style. The suites have been superbly redesigned to offer discerning guests the best that modern technology and superior craftsmanship can provide. Each Blue Train suite has a fully appointed en-suite, featuring either a bath or a shower. uxury Accommodation: Choice of twin-beds or double bed, and a full size bath with hand shower. Luxury suites are equipped with CD players and video machines. Dining/Menu A sophisticated, opulent atmosphere, gourmet menu and the finest South African wines sourced from boutique vineyards, make dining on The Blue Train a magnificent experience. The Blue Trains own creative team of chefs have created a menu to delight the most discerning palate. Only the freshest ingredients meet The Blue Train standards. Meals and snacks are prepared in the streamlined kitchen, designed to The Blue Train engineers exacting specifications. Guests are offered a choice of entrees, soups, fish, meat dishes, desserts, coffee and cheese platters, all beautifully presented. Typically, South African cuisine includes, Karoo lamb, kabeljou, Knysna oysters, snoek, crayfish and impala. Also offered is an abundant array of the finest South African fruit and vegetables. The Blue Train is a showcase for South African wines, which have been selected to compliment each course on the menu after meticulous consultation with top South African wine experts. Breakfast, lunch and supper are the main meals and high tea is served each afternoon in the main lounge. During high tea, various snacks are served - these include cucumber sandwiches, dainty cakes, fresh scones and cream and other irresistible delicacies with an assortment of fine teas and coffees. On-board Services A variety of delicious snacks and beverages served in the suites, on request, by butlers; A limited on-board laundry and valet service; Safes are provided in all suites for the safe keeping of your valuable belongings; A luggage van is available to store any additional luggage that a guest will not need during the journey. All these services are already included in the fare. Trained first aid personnel are on board at all times. In the event of an emergency, doctors and medical personnel can be contacted at the various stations en-route; or flown in by helicopter. Two engineers with specialised expertise on luxury trains are always on board the Blue Train and are happy to share their knowledge with train enthusiasts. The telephone beside each bed allows guests to dial the Train Manager, the personal butler or the butler on duty 24 hours a day. Should a guest wish to make an external call (local or international), the staff will gladly assist them in doing so at a nominal cost. Fax facilities are also available on board. The journey Pretoria to Cape Town Board The Blue Train in the jacaranda city of Pretoria - the administrative capital of South Africa from where you travel south through farmlands and along the 'golden arc'; visible only by the mining shafts in the distance. En-route to Cape Town, stop in Kimberly for an off-the-train excursion. Kimberly was once the epicenter of a worldwide diamond rush. This city's chequered history is inextricably linked with the romance of those rare and beautiful stones. Here The Blue Train guests are cordially invited to disembark, take a tour through the streets of modern day Kimberly to visit the Kimberly Mine Museum and the 'Big Hole'. The Blue Train luxury coach is used to transport guests, alternatively they can be taken on a historic electric tram when it is available. Step back into a world of pioneers and adventurers-circa 1880. Marvel at the sheer magnitude of the "Big Hole", the largest hole in the world excavated by hand. At a replica of an alluvial-diamond diggers, try your luck at panning and possibly finding a diamond of your very own! Board The Blue Train once more and continue on to a South bound journey into the heartland of the Great Karoo. Awaken to the sight of vineyards and orchards as you descend through mysterious and beautiful valleys and mountains, such as Drakenstein, Slanghoek and Elandskloof - towards Cape Town's imposing and instantly recognisable Table Mountain, sentinel and gateway to the African continent. The city of Cape Town has a lot to offer a descerning tourist, among places of interest, you can visit pearl-white beaches washed by the Indian and Atlantic Oceans, watch colourful, old-style fishing boats in Kalk Bay, explore the old Malay slave quarters, enjoy the finest seafood in the world, wander through Greenmarket Square's famous flea market and enjoy a sundowner at the Victoria and Alfred Waterfront. 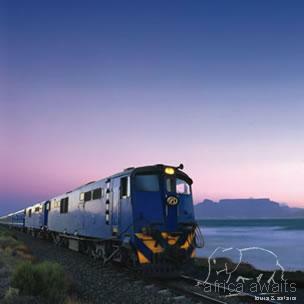 With your holiday, safari or business trip from in to The Blue Train in Journeys by Train.